I hate using this blog for anything personal, as my stalker Don Hillenbrand does all the time. 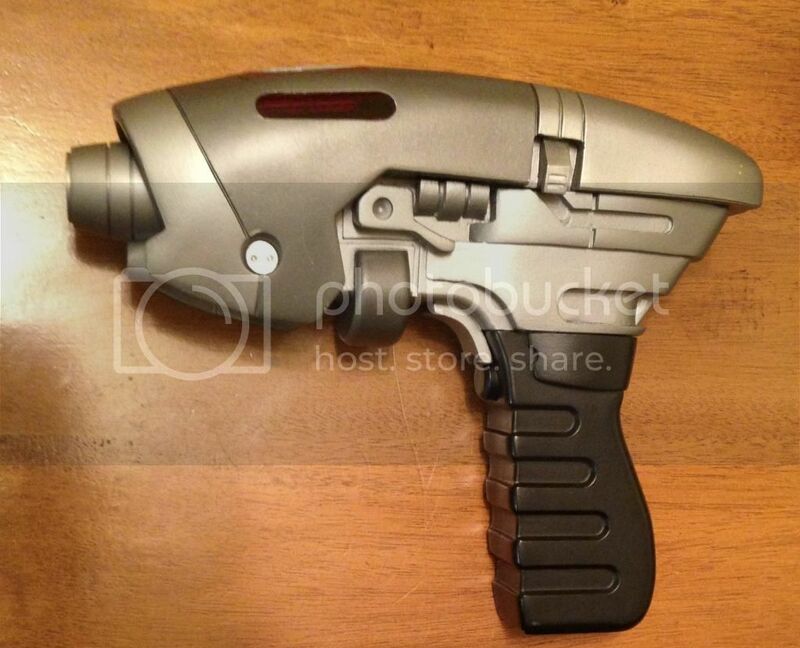 This is the premier Star Trek prop blog for a reason. I have, for almost 8 years now, given out the best advice and information possible and help protect and enable the collecting community. Gerald Gurian, who writes the other major Star Trek blog and I are friends and work together to get the best information to you, our readers. But the nonsense with the prop fraud Kevin Hanson deseves attention. Whenever a dispicable, lying, fraud tries to perpetuate his lies, it needs to be called out, so good people dont get taken. Now he has taken to trying to accuse me of the type of fraud HE engages in. Kevin Hanson sent this message to the Star Trek: Phase II Kickstarter (which I ran for Phase II) trying to cause trouble. Does this violate Kickstarter rules since the person raising the money, Alec Peters, is not in any way affiliated with Star Trek Phase II? He even made up a production company name in order to do this. All of the money has gone to him and he is not legally obligated to turn it over to the project. His most recent company, Propworx, went bankrupt as did a string of other companies that he started and ran into the ground. I feel for the Phase II people if they get caught in the cross-fire from any inappropriate money issues and potential legal consequences. So here is the truth (something Kevin clearly knows nothing about). I am a producer on Star Trek Phase II. Something Kevin would know if he did the slightest bit of actual research. He even made up a production company name in order to do this. Phase II productions is a user name. The Production company is "Retro Film Studios", which is 100% owned by James Cawley, who asked me to do this Kickstarter for him. All of the money has gone to him and he is not legally obligated to turn it over to the project. While all of the money went to a separate account I own, it was immediately used to pay Phase II bills at the direction of James Cawley, the Executive Producer and owner of Phase II. This is how honest people work Kevin. His most recent company, Propworx, went bankrupt as did a string of other companies that he started and ran into the ground. While Propworx went through a bankruptcy (like say MGM, GM, every major airline and millions of other legitimate companies), that is the only company I have ever had that did so. One company I started sold for $ 16 million. (It should be noted Kevin Hanson has no job and lives off an inheritance, so he clearly knows nothing about real work). So once again, we see how dishonest and despicable this fraud is. 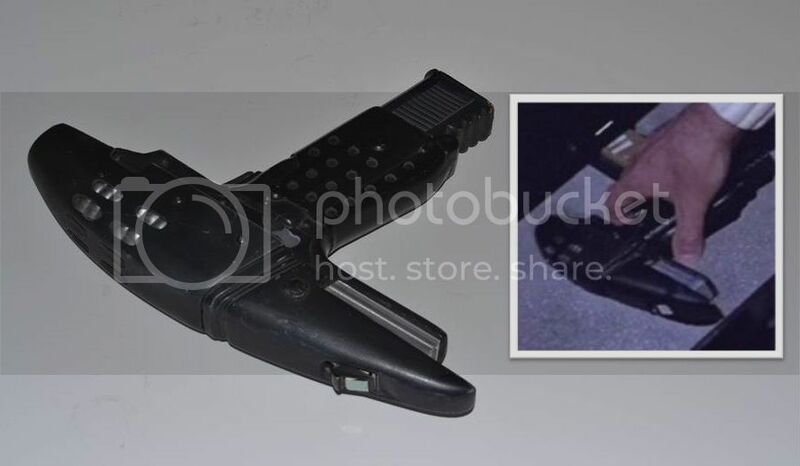 Star Trek prop collectors should stay away from him as well as Don Hillenbrand, who is helping to promote prop fraud by enabling Kevin Hanson, and attacking me (once again) on his blog. In fact Don is also promoting Michael Moore videos about props. And we have already proven in the same article that Michael Moore sells fakes and lies about the provenance. So Don is clearly promoting fraud as well. Way to protect people Don! I have a reputation of protecting the collecting community by exposing fraud. My list of accomplishments and the people I have helped is second to none in the Star Trek community. Good people need to know who they can trust and who is only out for themselves. Kevin Hanson and Don Hillenbrand are the latter. Christie's Catalogs - $ 29.99 a set! So you want a set of Christis's Star Trek auction catalogs? They are now $ 29.99 on Amazon (plus shipping). Our friend Anthony Sforza makes it onto Cnet! Our good friend and fellow IAW veteran Anthony Sforza gets the attention his amazing collection deserves in this video! The original Memorabilia Company in England has 15 props for sale. The items are choice, but the prices high. 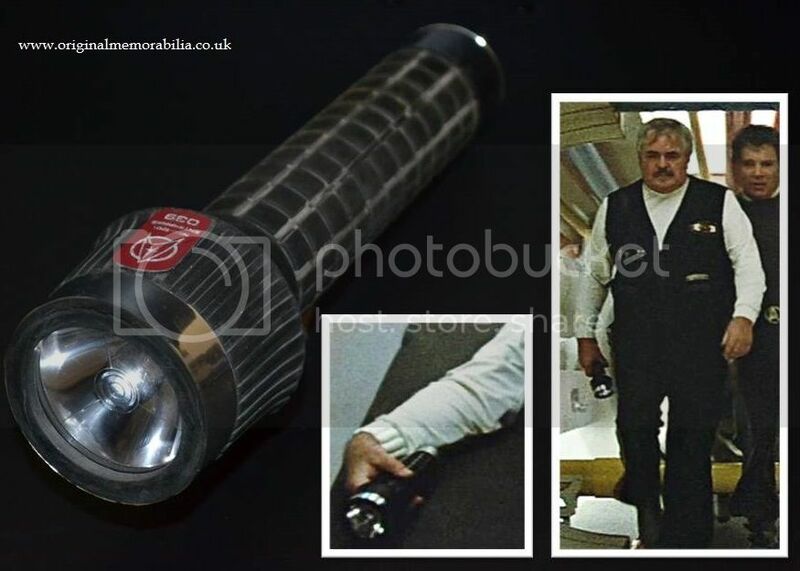 This collection of 15 props includes a wide range of items, from Scottys torch for £1,295.00 to a 30 year old Starfleet phaser from Star trek II ‘The Wrath of Khan’ and a number of fabulous items made by the specialist Star Trek prop maker Richard Coyle, of RAC Props (www.racprops.com) including a very special Klingon pump-action beaked nose disruptor. A solid very heavy piece made of cast resin with a sliding black pump and painted in the familiar Klingon rust, metallic silver and black colour scheme with distressed finish. 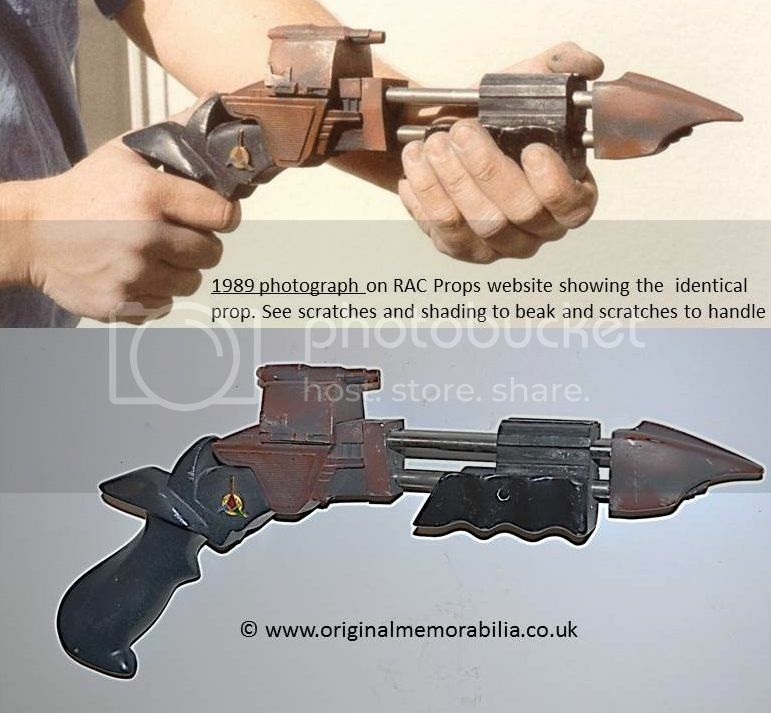 This wonderful piece was screen used in Star Trek VI and has also been matched to an original 1989 photograph on RAC Props website gallery showing the identical piece. 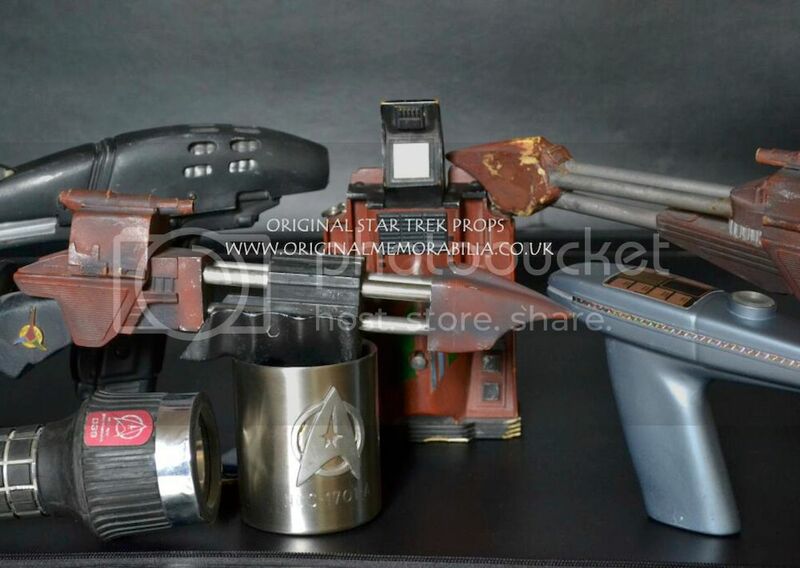 Providing the ultimate authenticity for any Star Trek collector and will be sold for £4,495.00 Richard Coyle has also confirmed in writing that he made this special pistol along with other items that will be going up for sale including a still working Klingon Tricorder made for Star Trek V & VI and a fabulous Starfleet Assault Phaser ‘Hero Version’ used in Star trek V & VI priced at £3,495.00. For the smaller budget original Paramount parking passes can be bought for £100. All the items in this collection were originally obtained from a named Star Trek prop master with written provenance held on our files. Each item comes with full details within the Certificate of Authenticity. To confirm, the items being listed will go on sale at a stated and fixed price. There shall not be an auction process. 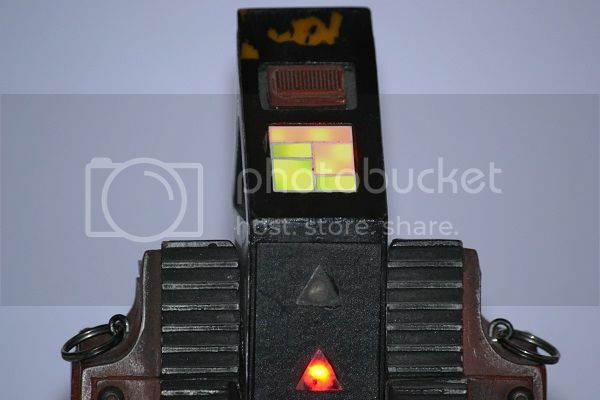 However we expect the props due to their rarity to attract widespread interest amongst the Star Trek community and beyond.